I work with Google Apps all day long as a technology instruction librarian…trying desperately to find solutions in education using these tools. And some brilliant knitters created this amazing video for Google Chrome, the web giant’s latest venture in Browser creation, to highlight all its best features. The amount of work that went into this video must have been pretty incredible, and it totally delivered. I think I’m geeking out, like crazy. No, I’m definitely geeking out like crazy. As the frost sets in for a solid Boston winter, it also posed the perfect opportunity to knit up a pair of mittens to fend off the frost. Immediately after seeing the Quo Vadis fair isle mittens by Spilly Jane, I had to have a pair (or a couple) for friends, family, and maybe even myself when we get right down to it. The pair pictured above is the first in this endeavor; I’ve already completed another mitten and half of its other half in a different colorway. Spilly Jane’s pattern is clear and the chart is easy to read. You can create any combination of colors to make each pair of these mittens stand on its own, and the sizing is just perfect for my hands, so I have zero complaints. Plus, the pattern is offered up as a free Ravelry download, so there are absolutely no excuses to not making this very set of warmers. 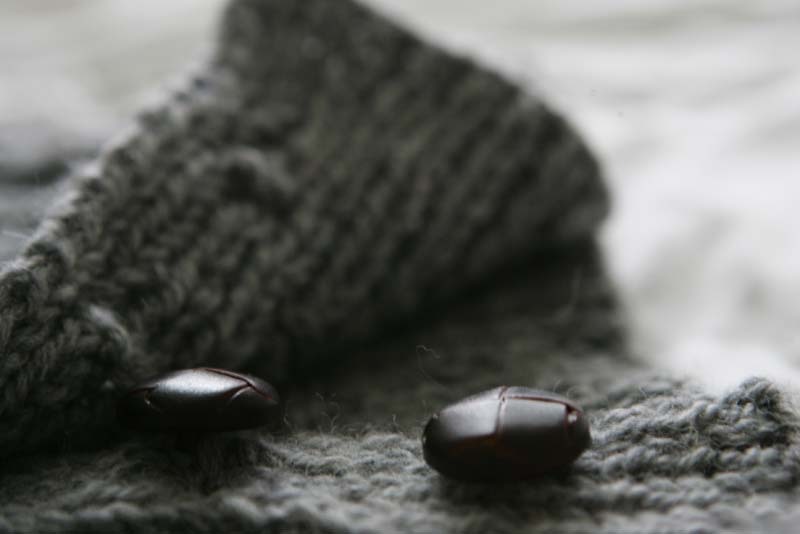 Plus, fair isle knitting is particularly great for mittens; it creates an added layer of padding in the mitten without necessarily having to knit an “inner mitt”, and in my humble opinion, that makes me quite excited. 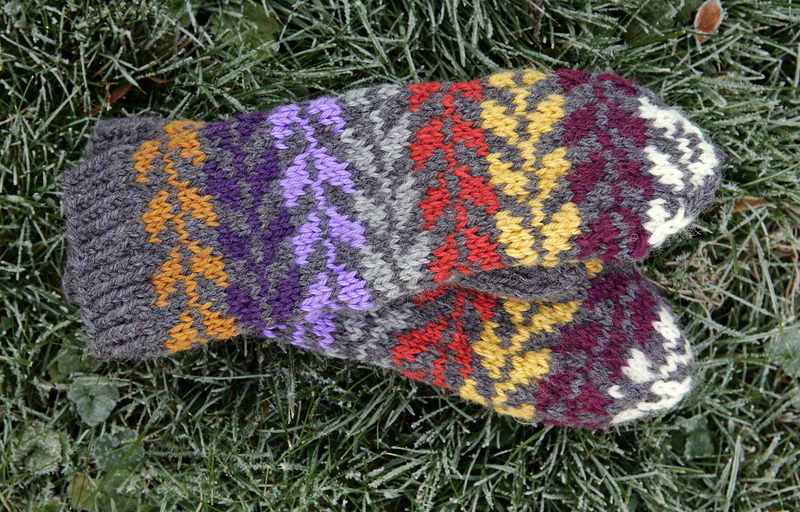 This winter I intend to break all Kraftwork records and make as many Fair Isle style mittens as possible. You can track my progess on the endeavor at its very own Flickr set. Drink up this inspiration: The Thermis. I have squealed with delight several times over the beautiful results of the Thermis neckwarmer, a fabulous design my Kris Knits (which you can scoop up here). I’m so in love with the way it looks on (and with how beautifully written the pattern was–and so easy to follow), I’ve already nearly finished another version of the Thermis in white with black leather covered buttons as a gift for my Mum for Christmas. Originally, I was inspired to knit up the Thermis after seeing one of my favorite knitting bloggers, ColoursKnits, show off her completed neckwarmer. The photos of knitwear on this blog are astoundingly beautiful; and since the inspiration to knit it up came from the really cool photos of the finished project, I decided I wanted to shoot mine the same way as an homage to the inspiration. 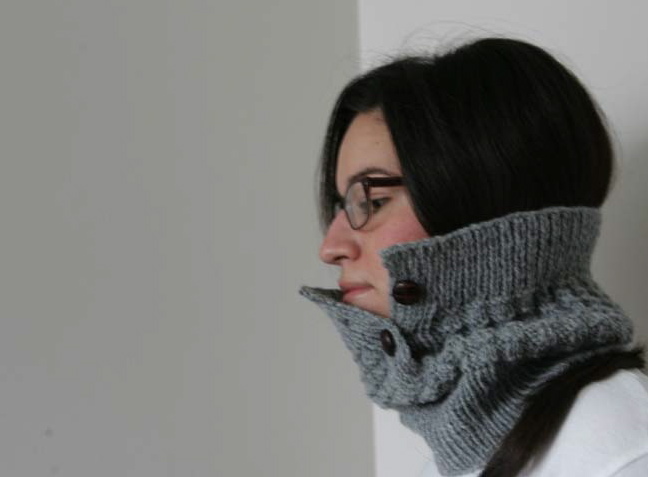 I highly suggest you make one of these if you are looking for a unisex neckwarmer that has some interesting detail; the waffle stitch pops so well in person, everyone will ooh and ahh over your creation. And they’ll never know how simple it is to make. Of course, you can check out many more photos of the Thermis at its flickr set. If you’re looking for accessories to knit up for friends this holiday, dump this in your queue as the next project. Candy canes and snowmen…and all that ho hum. It’s a mad dash to get all the holiday knitted gifts completed; and this year, I had two orders for comissioned pieces (a set of Bella Swan cabled mittens and a hearts beret for a co-workers 16 year old daughter and two Minnesota Vikings Hats for a friend of my Mum’s son and his wife, now living in Minnesota) plus a whole boat load of friends and family I had specific ideas in mind for gifting. That being said, there are plenty of lamp-lit hours of the eve to take to all the extras; these include the delicious Candy Cane Stocking (available in the Knit Simple Holiday 2009 magazine and via Ravelry) and the delicious new pattern for baby Snowmen from MochiMochi Land, which is free with any pattern purchase from Anna H. through December 26 so nod over and get a twofer! You can track it all at the Ho Holiday flickr set, though its a bit sparse right now. I have a penchant for knitting up what friends like to dub “critters”. I gift a lot of them out, but then, I save a whole bunch too, never quite sure what to do with half of them. But Rill-Raccoon Rox is certainly one I’m keeping for sure. Created by the ever amazing Donna Wilson, author of one of my favorite critter books The Knitted Odd-Bod Bunch, he just came out so smashing I could resist the idea of saving him for my own. And inspired by the latest novel by Audrey Niggineger, Her Fearful Symmetry, I have named him after one of the lead characters, Robert Fenshaw, a historian who is in love with the ghost of his since deceased lady friend. What’s even cooler is that the wonderfuly brilliant snaps of Robert Fenshaw by my photographer extraordinaire Harry S. Cahill, got the notice of the lovely Ravelery people who keep up the pattern pages for Donna Wilson. And they asked to feature him thereabouts! You can see it here. 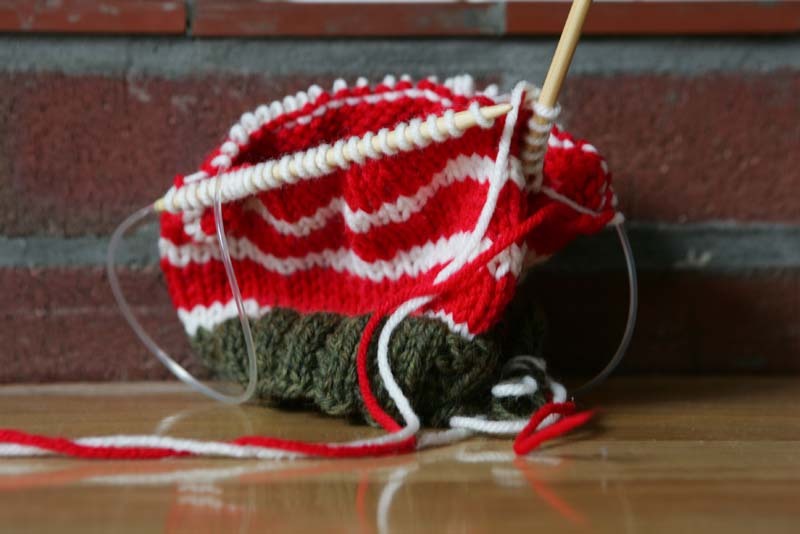 Wilson’s patterns are easy to follow and a pleasure to knit up. 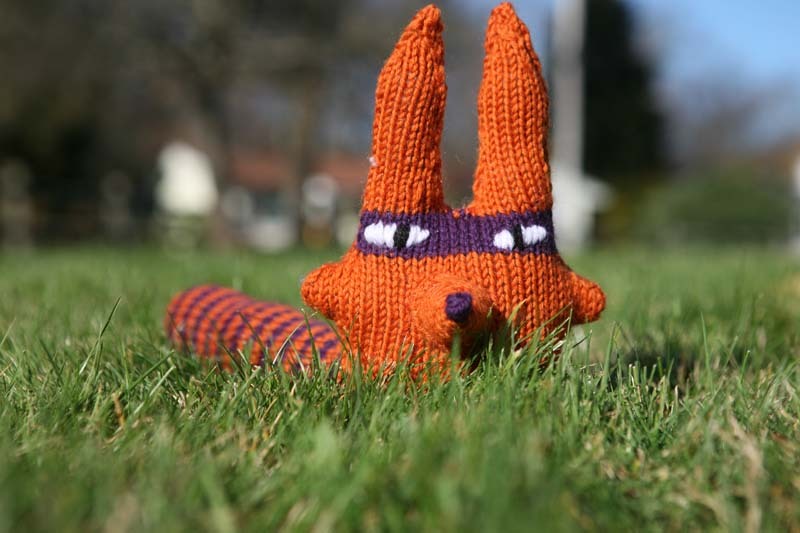 Definitly if you have a knitting friend who loves critters, this is a must buy for any holiday gifting. As always, more snaps of Robert Fenshaw at his Flickr Set. Oh, and be sure to check out all of Donna Wilson’s amazing work. Booking It…To Bed, That Is. Lately, I’ve been notching off even more books on the “Life List” than I have since my days of working nights…many slow nights. Two years of grad school plus work did not afford me as much outside reading time as I would normally like, and quite frankly, things were busy. 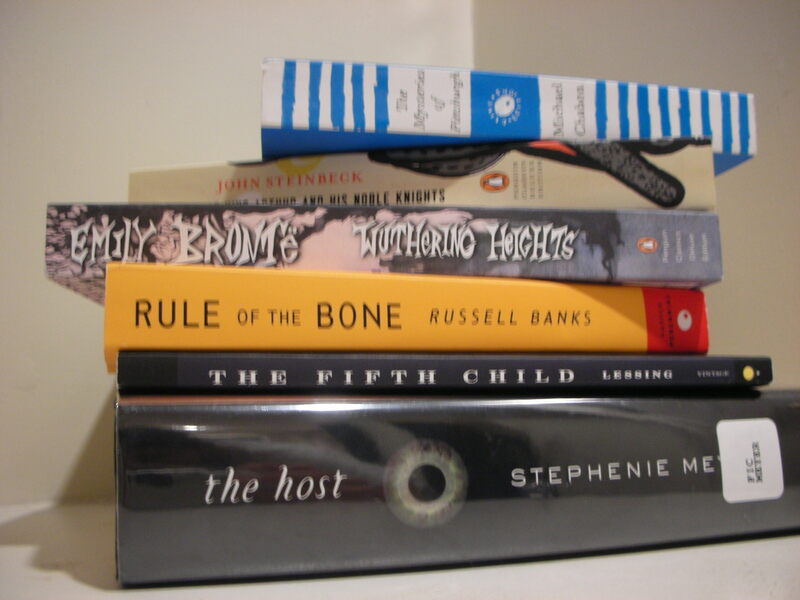 But now that I have to be up so early in the morning on the reg., I’ve fallen into a beautiful routine I didn’t have for years; tucking into bed before 10 p.m. and spending about 2 hours reading…and reading…and reading. This has afforded me the ability to carve out time daily (even if it is betwixt the sheets) and really trim off at least one, if not two, books a week. And while I usually have one young adult novel going alongside a classic or something more “grown up”, it’s a wonderful balance of fantasy and fun…with the added excuse that as a librarian who works with 6-12 graders, reading those Y.A. books, for recommendations sake, makes that much more sense. I’ve even taken re-reading classics I haven’t picked up in awhile; like “Wuthering Heights”, “Sense and Sensibility”, “Anne of Green Gables” and even Poe. File Under: Send me suggestions. What have you read lately?